SUNNYVALE, CA--(Marketwired - February 15, 2016) - Project Hosts, a CSP and leading provider of Secure Cloud Services for Azure and hosted Microsoft solutions, announced today that its FedRAMP SaaS-compliant Federal Private Cloud now supports websites powered by content management systems from Drupal, Joomla! and WordPress. U.S. federal and state government agencies can now quickly and easily create and manage their websites while having complete assurance that they are fully secured and meet all of the GSA's FedRAMP SaaS-level compliance controls. 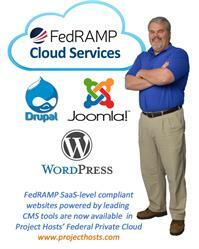 "If you're an agency who needs to build and maintain a FedRAMP compliant website using Drupal, Joomla! or WordPress, we have exactly what you need," said Scott Chapman, CEO and co-founder of Project Hosts. "Unlike FedRAMP Infrastructure-as-a-Service (IaaS) website offerings where you still have to put in place and manage all of the scanning, patching, log correlation, intrusion detection, incident response and other security services required for FISMA compliance, our FedRAMP SaaS-level compliant websites allow you to focus on your website content and leave all of those security controls to us." Project Hosts delivers a trusted government cloud platform that federal and state agencies can rely on to gain all the advantages of cloud computing quickly and affordably and with security they require. Options are available for community, hybrid and private cloud models, giving offices and agencies the flexibility to implement customizations, use approved third-party applications and add-ons, and real-time business intelligence reports. For a complete description of Project Hosts' FedRAMP Federal Private Cloud solutions visit: http://www.projecthosts.com/fedramp-saas-clouds.aspx. Federal and state government agencies can procure Project Hosts FedRAMP SaaS-level compliant solutions directly from the GSA Schedule listing of Federal Private Clouds. About FedRAMP: FedRAMP is a U.S. government-wide program that provides a standardized approach to security assessment, authorization and continuous monitoring for cloud products and services. The program was developed to significantly reduce the effort and expense that would be incurred by government agencies to achieve high-level standards for securing government data. Designed as an "approve once, deploy many" program, authorized Cloud Service Providers (CSPs) would attain a provisional Authority To Operate (ATO) and provide cloud services for many agencies. Government agencies can then select an authorized CSP in an effort to save taxpayer expense on government IT infrastructure and cloud applications. The JAB is the primary governance group of the FedRAMP program, consisting of the chief information officers of the Department of Defense, the Department of Homeland Security and the U.S. General Services Administration. The FedRAMP program supports the U.S. government's "Cloud-First" initiative to enable U.S. federal agencies to use managed service providers that enable cloud computing capabilities. The FedRAMP program is designed to comply with the Federal Information Security Management Act of 2002 (FISMA). All government agencies are required to use FedRAMP. About this company Project Hosts, Inc.
FedRAMP SaaS-level compliant websites powered by CMS tools from Drupal, Joomla, and WordPress are now available from Project Hosts' Federal Private Cloud.